If Chima explodes as Ninjago has, these sets could be the "Holy Grail"
You may not agree with all of these points, but I feel the reward that could come out of investing in these sets is well worth the risk. So this blog is going to cover 3 sets that are retiring, why I think they are winners, and a bit of proof to go with it. Battle for the golden CHI at the Eagle’s Castle! 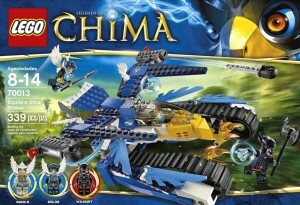 Soar to the Eagle’s Castle, deep inside the eagle territory of Chima, and compete in an epic battle for the Golden CHI! Attach Lennox and Worriz onto their Speedorz, pull the rip cord, fly up the ramp and aim for the CHI! Hit the CHI, open the wings of the Eagle’s Castle and reveal the golden CHI to win! Attach the power-upz and take the battle to the next level! Set includes 3 minifigures with assorted weapons, 2 Speedorz, 2 rip cords, 4 weapons, 2 power-upz, 12 CHI and 10 game cards. Put your timing and accuracy to the test with this lightning-fast game for 2 players! Attach the power-upz and take the battle to the next level! 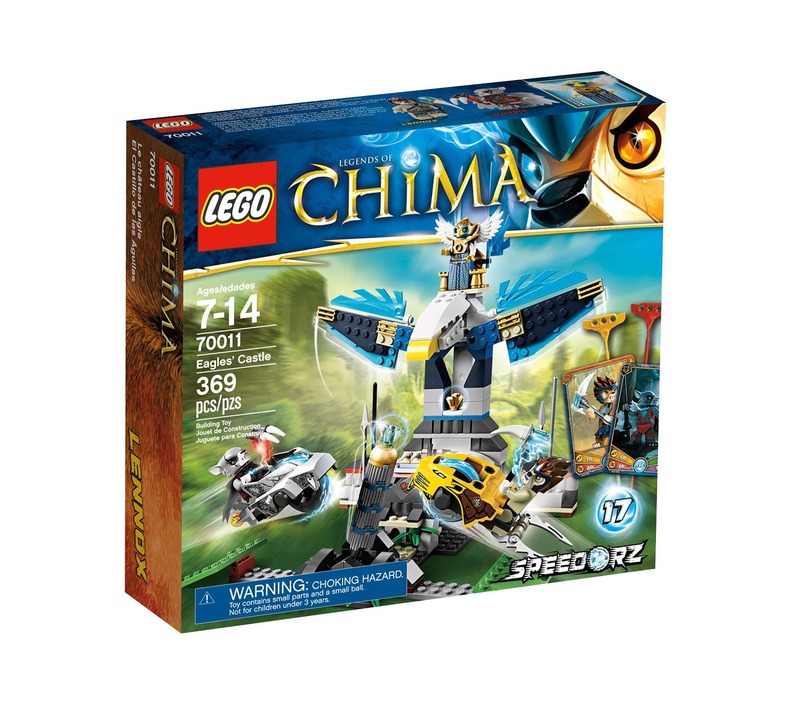 Collect the entire LEGO® Chima Speedorz series to create combo games! Investment Outlook: I don't know for sure, but I assume Ed coined the phrase "Spinners are Winners!"? Either way, its spot on. So Speedorz should follow the same path, correct? Well, unfortunately I am not so sure. Most of the Speedorz have a couple of problems. First, they overall just don't look as good as the Spinners from Ninjago do. I think what set Ninjago off was several bigger sets that included Spinner battle arenas and were extremely detailed. 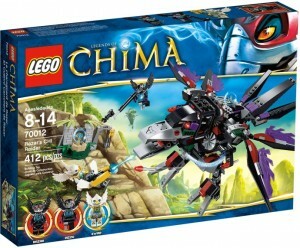 As for Chima, Lego may have a mistake (Gasp!) by making the sets a bit too simple and flooding the market with too many different types of them, diluting the pool of possible winners. Most of these have been severely discounted by retailers and still sat by the 100s in stores because of these facts. During December, they sold maybe slightly better from what I could tell, but most of them were not coming close to retail. So avoid this one as well, right? First off, despite the market for these being the way it is, there are still Speedorz fans. If you have walked into a Lego store with one of these displays, the children are all over it. On top of that, this is the most recognizable of the Speedorz and seems to be the most popular one. From the look of it, this is by far the best set and has the most pieces to it, as well as 3 quality minifigures. As with the other sets we are looking at, it is retiring soon even though it just came out in January. We all know some of the most successful Lego sets have been 1 year runs. Also, being the best of the Speedorz sets, it will be by far the most sought after. Being the most expensive of them, it will most likely be stocked the least as well. Finally, it is a Toys R Us Exclusive, so there are a lot less people that have actually seen it or purchased it than all the other speedorz sets. Should you buy this at retail? Not necessarily - although I think it will still gain there. A lot of my investment value on this set comes from its clearancing in the Lego store. I picked up quite a few of these the last several weeks ago for 20$. At that price it is a total steal, and you hopefully will be able to find them in your local Lego stores as well. As for at Toys R Us, they have had a couple of good sales on these, and I really think you are pretty safe at 30$. Toys R Us exclusives seem to linger a bit longer because they stock them somewhat abnormally, so I think you still have a chance to get this set. It certainly was not incredibly popular during the Christmas season, but it definitely rose quite a bit - only 67 listings in the past 90 days on Ebay meaning the last month (including the beginning of January) outsold the last two months combined considerably. This does not tell us a whole lot, but it does say that people were searching the set out. More over, the average sold listing is great. The set sold at retail - and has continued to do so making its investment outlook a lot better. Now that this set is sold out at Lego.com, and as it dwindles at Toys R Us, it will start creeping up. Now how about a good comparison? See what I mean? I will agree the Dojo is a bit cooler, but it was a bit more overpriced so I feel like it will work itself out. This set was also, similarly, the best of the first spinner sets released. I want to make it clear, this may not be a huge investment gainer - and definitely don't go out and buy a ton at 40$. However, I think this set has a lot of potential for the reasons mentioned above. Lego is seemingly getting rid of all their current Speedorz. If they don't come back, this becomes a possible "legendary" retired set. If they do come back, this is the original best set with the most to offer. On potential alone I think it is worth having and is an absolute no-brainer at half the price. Do not be worried about the overstocking or the clearancing of this item. It certainly didn't hurt the price during December and with just a one year run, these will dwindle soon enough. This is a very modest prediction - especially since several of the latest listings have sold at just under 50$. Looking at this, if you get this set at 20$ you will easily double your money. This set has the potential to go much higher than that, so a safe projection of doubling your money with the possible to do much more is the best you could ask for out of a small set. Where to Buy: Unless TRU has another big sale, get this at the Lego store if they still have them. Grab the Eagle tribe CHI with Razar’s CHI Raider! Climb through the clouds and up to the Eagle tribe’s CHI temple in the sky with Razar’s CHI Raider! Use the 4 flick missiles, rear storage bay and poseable beak, wings, tail, legs and talons to battle past the Eagle tribe’s defenses! Ewar’s only defense against the raucous raven is to power up the CHI cannon and send Razar flapping back to his nest… unless Rizzo can sneak by to swipe the CHI with his hook tool! Includes 3 minifigures with a weapon. Open and close the beak! Fire the raven flick missiles! Pose the wings, tail, legs and talons! Nab the CHI with Rizzo’s extended hook! Investment Outlook: I know this section is called "investment outlook", but let's just ignore that for a second :). I love this set. First of all, its a giant freaking bird! Its awesome and goofy looking, but at the same time incredibly detailed. All the parts of it move, it has flick missiles and a cannon. Its just overall a really impressive set seen built. I have really struggled not to pop one open and take it to work with me. So it didn't "fly" during Christmas. However, a couple of key points here. First, it went down to $27.98 at the Lego store and was sold out fairly quickly; one of the fastest of the in-stock discount sets to sell out. It sold out at my Lego store very fast two. Second, It was really never promoted or toted up by anyone during the Christmas season like the Chi Temple or Eagle Castle were. This is a Walmart exclusive and Walmart had a very quiet $31.98 promotion on these, but other than that it was all blank until the Lego store had theirs. This set will retire with about the quietest retirement you could ever have. So why is it worth picking up? Well, this is a big sleeper to me. I have gone over why its such an awesome set above, but it is definitely one that appeals to people who like the theme. 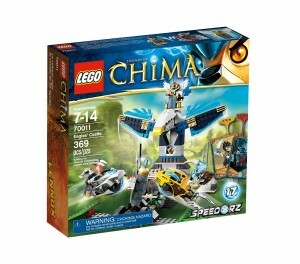 I part out a lot of Chima sets and the birds are the most sought after for sure. This one comes with three of them, plus the giant bird vehicle. In Lego what type of set sells the best out of anything? The answer is vehicles. Can you remember another set with a giant bird vehicle? Also, a one year run and a completely under-the-radar retirement. There are not investors sitting around with 100 of these in their attic. Heck, I may be the only one here with multiples. 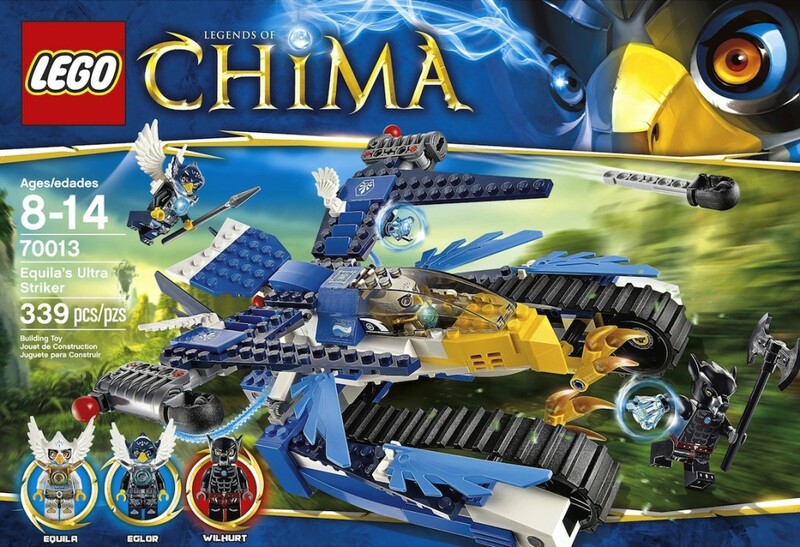 But looking back at my thoughts on Chima, I really think this theme will start to explode once retirements start hitting and this is a set that people will look back at and say "how the heck did I miss this set"? In Lego investment history, there have been tons of sets that no one really seemed to want or want to pay for when they were out, and then retirement hits and they explode. I think this set has a good chance to follow in those footsteps. 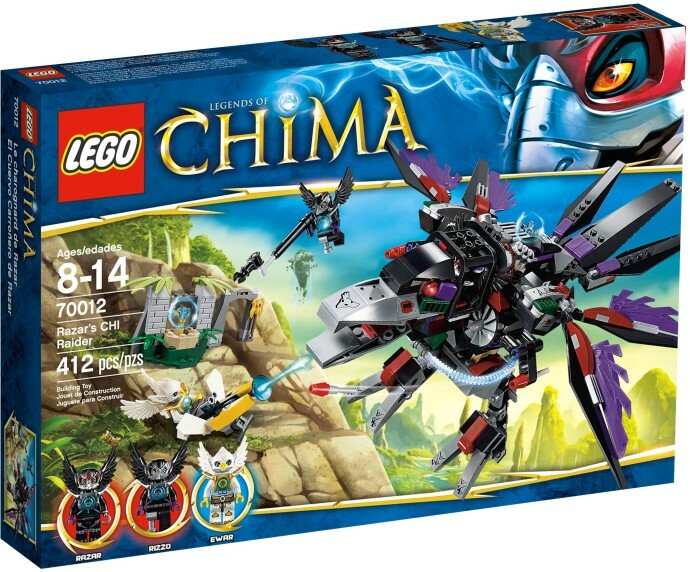 I don't believe it will explode right out of the gate, but as Chima continues to grow in popularity I think this set will see really nice growth with the potential to become one of the sets you regret buying. To me, that makes it worth it to have a good stash of them. And how many of us can say we are investing in a set no one else is? Where to buy: Check your Lego store. If they don't, try Walmart as many still have them at $31.98. Test out Equila’s Ultra Striker and protect the magical CHI! Take Equila’s high-tech Ultra Striker for the ultimate test drive! Unleash the power of the Eagle tribe’s awesome battle machine featuring massive rubber tracks, huge opening wings, double eagle rocket shooters, front claws for clearing tracks and a cool ejection system! Equila, the great warrior and weapons specialist Eglor are on top of their game, but they must be ready to defend its CHI power when master hunter Wilhurt spots it! Make sure the crafty wolf goes back to his cave empty-pawed! Includes 3 minifigures and assorted weapons. Clear the roads with the sharp claws! This is the set that I think is the absolute gem of the early retiring Chima sets. It's another bird vehicle with feathers hanging off of it and the beak and talons in front. I think it has an incredible look to it as a tank but also a bird. This one is just special. First, it again has tons of moving parts. The tracks, the wings and cockpit can open, the top can eject from the bottom section to fly ( similar to the Ultra Sonic Raider). As a playset, there really is not much more you could get for just 40$. Along with that, a lot of the pieces are rarer or exclusive pieces like the wings, the tracked rubber sections, and the yellow beak and tallons at the front. Overall, you get a lot of really cool pieces with this set as well. Along with its short run, it is a Target Exclusive in the US - just like our favorite sets the Orc Forge and the Zombies. However, this one has even a bit more exclusivity being an exclusive in the UK as well with Smyth's Toys. I think there will be a considerable amount of Chima fans later on who have never seen this set and immediately want it because of the playability and special pieces. It was discounted on Legoshop.com early in December and sold out very fast. I actually wanted to grab a few more and they were gone before I got the chance! Lastly, it again has two birds in it to go along with the tank representation of a bird. But the special Character here is Wilhurt. Although he is not exclusive to the set ( a lot of the smaller Chima sets don't have an exclusive figure), he is only in one other set ( a much more expensive one that may do some growing of its own) and he is a black wolf - the only one of the wolves that is black. I have sold him a few times and gotten 12$ for him pretty quickly. i think he will be a sought after figure. How has this set done lately? Where to buy: Target is your best shot now. I got most of mine when they were $31.98 on the weekend Target had the "10% off should probably make up for all your credit cards getting stolen" sale. I think at $31.98 this set is worth a bet. Disclaimers: I do want to stress, make your own decisions. We really have no relevant data on this theme to back up anyone's projection. There were people that though Prince of Persia, Atlantis, and especially Toy Story would do well - and that meant squat in the end. I have really spent a lot of time looking through Chima sets and seeing them built, parting them out, watching sales trends on Ebay. however, this theme could do nothing and everyone could laugh at me (which is fine). I have not invested my whole port folio in these sets for sure. However, I think these sets have the potential to do even better than my projections - honestly I toned down my thoughts on Equilas Ultra Striker - I just think that set rocks. Hopefully rather than make your mind up with my posts, I want to merely open the door for some of you to think about taking the plunge. Two months ago, I had that door padlocked, but I looked at everything decided the reward was worth the risk. Great Post. I might pick some of these sets up soon thanks to your post. I think we as investors are some times bias to sets that don't appeal to us. But we must remember the Lego is a children toy and it is ultimately children who are buying sets. It is ultimately children who are buying sets? That might be the case for the lego sets in regular stores, or for certain themes, but for most of the biggest winners, it must be AFOL who are the major driver of the appreciation after EOL. Batcave, UCS falcon, even the zombie, do you think children are the driver behind those high prices? With that said, good read from DNIIM. I'm already picking up some Chi Raider and Ultra strikers, partly because of deep discount so the risk is low. It's very interesting to see whether Chima can surprise most investors here on BP. DNIIM, are you going to have a Part III talk about the bigger sets? BTW, of all the small-mid sets currently on sale at Lego store, the eagle interceptor is the first one that is completely gone in my local store. I'm not sure whether that's because it might be the first ones discounted, or it speaks to its popularity? I have seen piles and piles of Chima items (bedding, etc) on clearance at Target... doesn't seem to bode well for its future.